Sample sales are probably one of my favorite places to go to shop. On Saturday, I hit up the SoHo & Nolita area with Andres. I checked out the Abaete Sample Sale - didn't really find anything I absolutely loved in my size - although I did spot a VERY cute white dress, but it was a size 6. It wasn't available in a size 0. Oh well. Then, I went to Ressurrection - didn't really find anything I absolutely loved there either. But then, I went to Only Hearts, (one of my favorite boutiques) where I wanted to buy everything. I resisted and only bought a fabulous green/watercolored tunic. Of course, I can't leave that area without going into Uniqlo, where I just picked up a black hoodie. After a day of shopping, got a chance to visit Sarah - since she just came back from a trip from China, and was going back to college in Maryland the next day. Also caught up with Darcy & Melissa who I haven't seen in awhile. 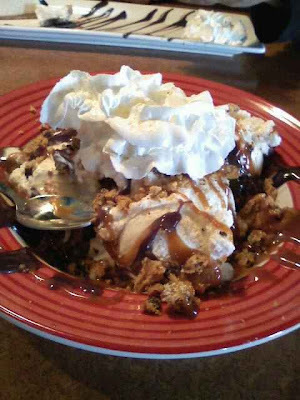 Went to eat some lunch at TGIFriday's with Kathleen, because we just haven't ate there in a long time. SO full. I had a huge bacon cheeseburger, then had the Chips Ahoy Ice Cream Sundae which was enormous. I couldn't even finish it. Then, we headed to Roosevelt Field Mall - (my favorite mall) probably the only mall I'll shop all day at in New York. Stopped at Sephora to get some new Bare Minerals makeup. Also stopped at Aerie to get some cute underwear. I also took advantage of their promotion. Just try on any bra and get a scratch off card, where you can get anything from money to spend in the store or a special discount. I earned a $10 money card, so I got a pretty sweet deal. Instead of paying 5 for $25, I only paid $15. Oh and I think every girl should check out their Audrey bra - which is their convertible bra. I still find it ridiculously funny that they have a bra named Audrey. Ohhh, I want a sundae! I actually had my first one ever recently and even though I'm not that big on ice cream it was so amazing. You make me want to shop. It's so hard to live in New York without shopping all the time, sigh.